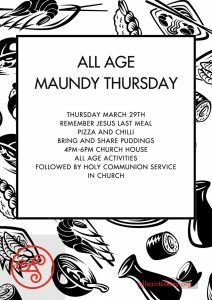 Why not join Lawrence his team of helpers in Church House for an all age (everyone welcome) Maundy Thursday tea? There will be pizza and chilli and you are invited to bring desserts to share. Meeting at 4pm and finishing at 6pm. As well as sharing food we will create a space to explore various parts of Holy Week through our senses: smell, sound, sight, taste and touch! There will also be lego and other activities for children to busy themselves with in the ‘in between’ times. At 6pm there is a service of Holy Communion in church. We look forward to seeing you there!